At least four nurses won this week – and so did Stephanie! They saw the ferocious battles that engulfed Washington, DC. They witnessed the tense stand-offs over healthcare policy. And they decided that, as nurses, they had something to say and should just run themselves. 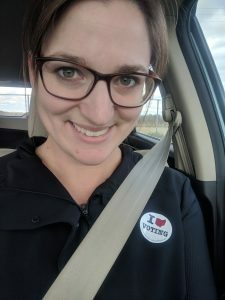 We found at least nine nurses who ran for office in the midterm elections this week, and at least five were waging their very first campaign! She won our election day contest: thank you, Stephanie! So how well did they do? Just 31 years old, Registered Nurse Lauren Underwood scored a stunning upset in Chicago’s suburbs! She unseated a four-term Republican incumbent in Illinois’ 14th Congressional District. Veteran lawmaker Eddie Bernice Johnson, who was a trail-blazing nurse as young black woman in the 1950s, easily won re-election in Texas. So did her Democratic colleague (and former LVN) Karen Bass in California. Over in Oregon, where Nurse Practitioner Rachel Prusak turned to politics because nurses “belong everywhere we can advocate for our communities,” she defeated a four-term incumbent in a state House race. We have a winner to announce ourselves as well! Stephanie is one of the many nurses who decided to make a difference last Tuesday. She cast her vote for Congress, and also responded to our invitation to send in your best Election Day selfie! We’ve sent her a gift card so she can pick out her own gift from our NurseSwag.com store. If you have any Election Day selfie of your own to share, don’t hesitate to still send it in!